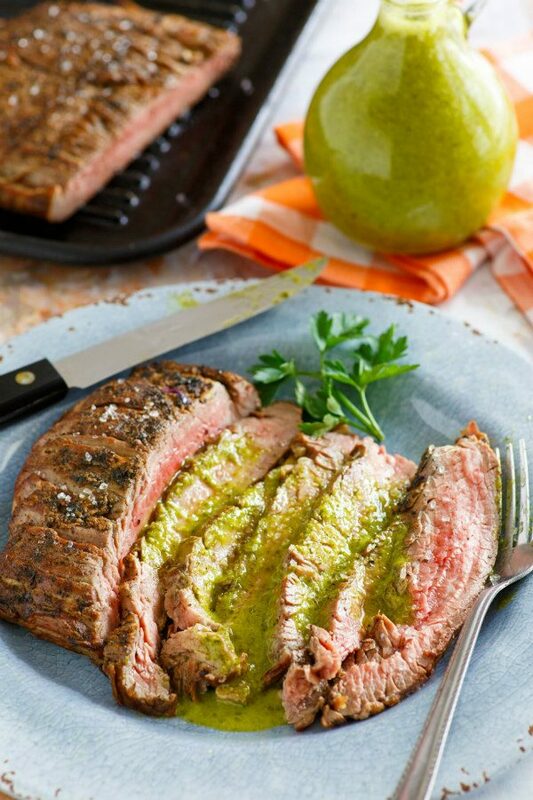 This Marinated Flank Steak with Cilantro Parsley Vinaigrette is a great recipe for grilling flank steak. This recipe calls for flank steak that is coated with a light marinade (just some simple seasonings). That gets the flavor going on the steak while it’s grilling. 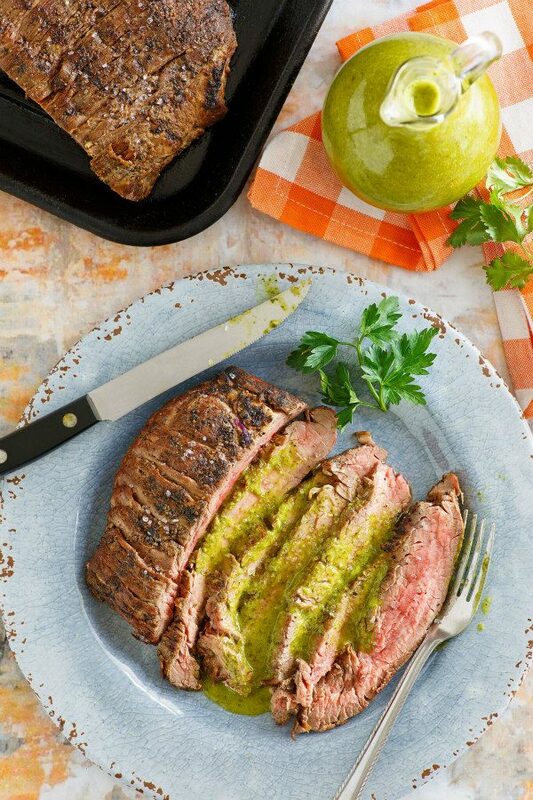 When it’s time to serve, the marinated flank steak is sliced thinly and served with a simple, homemade cilantro parsley vinaigrette. Flank steak is beef steak cut from the abdominal muscles or lower chest of the cow. It’s a common cut of steak found in your grocery store meat department. It’s usually sold in a 1 to 2 pound piece that is folded over and packaged. 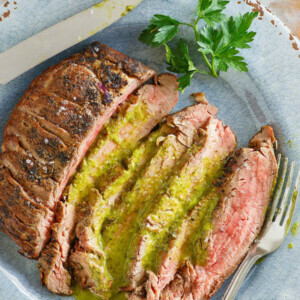 What’s the best way to cook flank steak? Flank steak can be grilled, pan-fried, broiled, or braised (the braising method will be the most tender option). 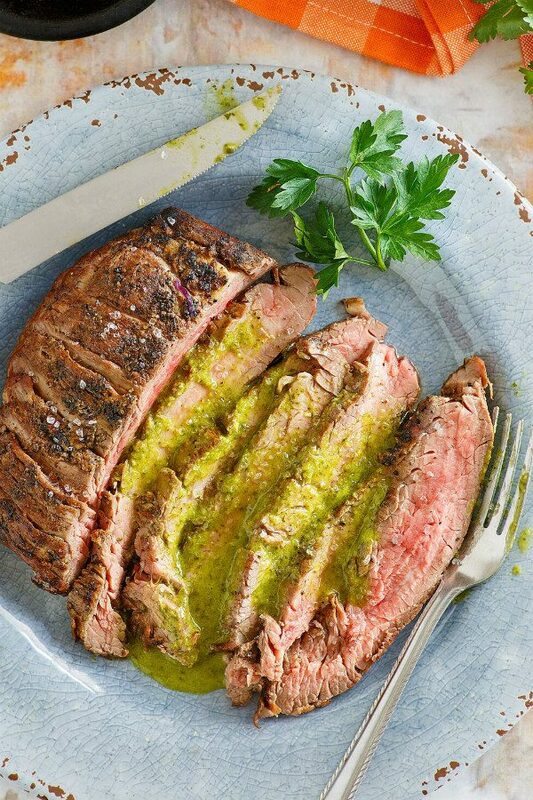 Marinated flank steak is another way to add tenderness (and flavor!) Cutting flank steak properly after cooking is super important. If you cut flank steak with the grain, it will be tough and not very appetizing. Cut thin slices across the grain, and you’ll end up with a more tender meat. I like to grill flank steak to a medium rare doneness, and then I let it sit for about 10 minutes before slicing it thinly across the grain. 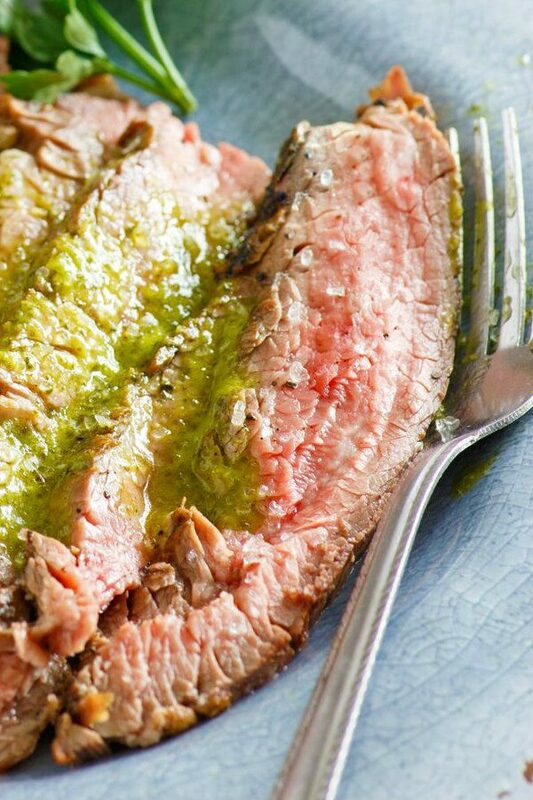 Serve this marinated flank steak and pass the vinaigrette for drizzling on top. It’s delicious! If you are looking for more steak recipes to grill, you might also enjoy my recipe for The Best Marinade for Grilling Skirt Steak or this Margarita Skirt Steak. Grilled Teriyaki Flank Steak and Dr. Pepper Grilled Steak are good choices too. 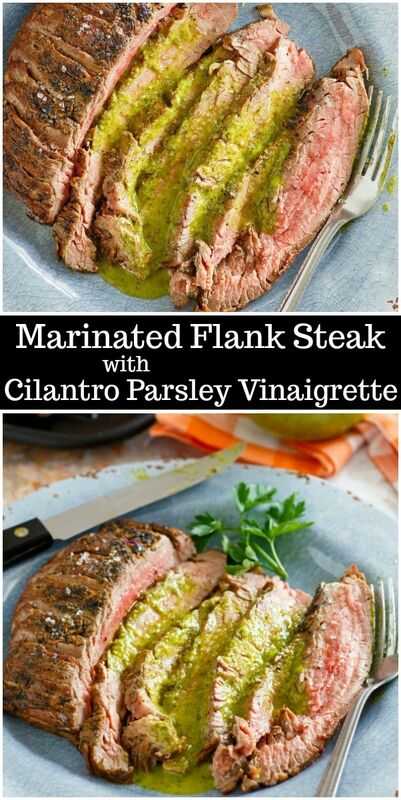 Another great way to eat flank steak! 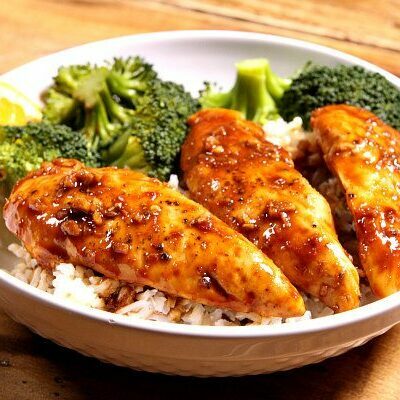 In a blender, combine all ingredients except the pepper and oil. Pulse a few times, and then with the motor running, gradually add oil through the hole in the blender lid. 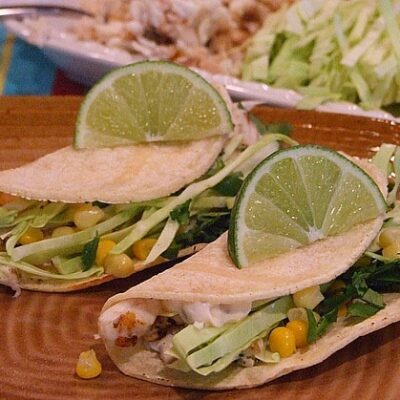 Stop once or twice to scrape down sides so that all ingredients are incorporated. The vinaigrette will thicken. Transfer to a bowl and season generously with pepper. Add more salt to taste, if needed. Use within an hour of preparation. 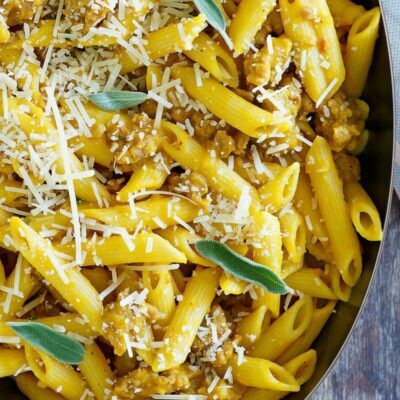 In a 13x9-inch pyrex pan, stir together the oil, vinegar, garlic, oregano, cumin and 1/2 teaspoon pepper. Add the steak and let it marinate at room temperature, turning occasionally, for up to 2 hours. Meanwhile, preheat the grill to high. When the grill is ready, lift the steak from the marinade (reserve marinade) and lay steak on the rack. Cover and grill, turning once and basting occasionally with marinade, until the steak is done to your liking, about 9 minutes for rare, which is recommended. Transfer steak to cutting board and let it rest for 5 minutes. Carve the steak across the grain and at a slight angle to the cutting board into very thin slices. Season to taste with salt and pepper, and arrange steak slices on plates. 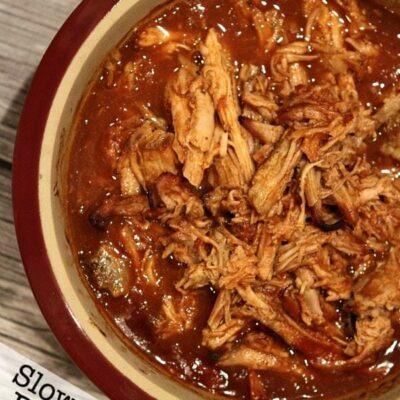 Serve immediately, passing vinaigrette to drizzle on meat.